Not the first time that FindMyFriends has proved its worth. Reception at 1pm had been the agreement only for FMF to reveal that Parker the chauffeur was still Boyton bound at 12:55. Change of plan, I texted, suggesting I meet him at a new location. Hopped on my wheels, past Greggs on my right and M&S on my left, over the road and apply brakes. Bingo. 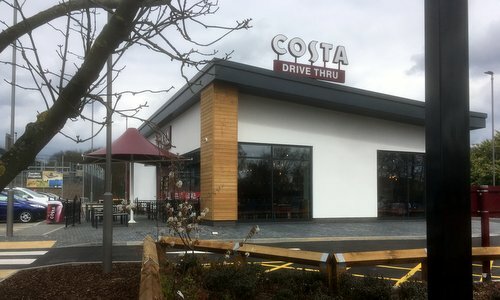 See, Costa,"the nation's favourite coffee shop" -- now owned by Coca-Cola, fact fans -- has now opened a swanky drive-thru (their spelling) about 400m from Adastral Park. 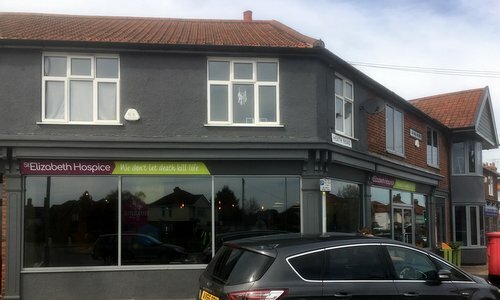 Sure, there's another Costa store roughly 200m over there within Next but its second floor location makes ordering from your car more of a challenge. Already been here a day or so after its March opening with Kev for a perfectly pleasant panini, and again on a weekend with me mum and me son when chaos reigned with the hot drinks queue. Which brings us to today and the bearded one is waiting outside. Buy any Primo hot drink or over ice drink (excluding seasonal drinks) or any packaged drink, a Ham & Cheese toastie or Chicken & Bacon sandwich or Tomato and Basil Soup or Mozzarella & Sun-Dried Tomato Pasta Salad and either crisps, pop chips (excluding Pom-Bear and sweet potato crisps) or a piece of fruit for £4.95 between 11am-2pm in one of our participating UK stores from Thursday 7th March to Wednesday 1st May 2019 inclusive. I found the chicken & bacon savoury, bag of upmarket Tyrells and confirmed with the patient young woman that I could have a flat white as the drink. Super. Andy, however, had picked up the ham toastie. Nope, said the woman. This is cheese-topped and not included. You want the basic ham & cheese, and off she went to find one. Chai latte too giving us a £9.90 lunch for two. Not half bad, Senor Costa. Shame it's a limited offering. Ironically, when another woman brought us our sarnies, my chicken thing was very much cheese-topped and yet within the deal. Hats off to her for then fetching some cutlery and a glass of water. Good leaf on the flat white, and hot and strong. If you're an early bird, they're open from 5:30am. Beware how long you stay, though, if you're a motorist. People have already been in the local paper showing their £100 fines for staying more than two hours. As always, you're better off on a bike. If it was a car -- Seat Arona. If they were passing by -- Alberto Costa. Already April, clocks have sprung forward, and finally time for a collectable light lunch outing. Kev's ruled himself out -- that lad doesn't know when to stop -- hence that ex-Defiants pairing of Broom and Cassy for the passenger and driver seats respectively. Both of us been to the hub cash machine. On y va. Lack of prep due to trip rustiness means we're fairly aimlessly heading into central Ipswich down that l-o-n-g Foxhall Road. Approaching the Bixley Road roundabout with Nosh over there, we both notice big changes to the old Heath Road Post Office. There are folk visibly sitting at tables. Andy executes a slick Starsky & Hutch 180 to take us into the handy bendy layby to park outsize the snazzy new St Elizabeth Hospice shop. Charity doings to the right, contemporary cafe to the left. That'll do nicely. All very smart421 within with those big windows. Apparently only been open for a few weeks, their savoury selection (to be expanded) currently comprises prepack sarnies or sausage rolls. Pas de probleme. Tuna & cu plus pack of Corkers crisps and a jolting Fentimans mandarin and seville orange jigger make for a fine Friday mini-feast. Folk at the other tables clearly have similar ideas. While Andy's sorting coffee and cake, excellent chance to run my literary eye over the floor-to-ceiling shelves of books. Again, I'm not the only one doing this. Chauffeur returns with a large milky coffee and a slab of top notch carrot cake. Being of sounder mental strength than myself, Andy's going without. I'm now pumped to bike back to work at speed if only we weren't in the car. Most enjoyable outskirts location in which to catch up. If it was a car -- Bentley State Limousine. If they were passing by -- Claire Foy. Talking to a culturally clued-up guy in the office last week, I chanced my arm. Later this week, I said, I'm off to see Daniel Kitson. He looked straight back at me. Who? Let's not get too hipster here. Few years back, I came across this fella's name from various trusted sources. Go see him, they all said. Not really a comedian and doesn't really tell jokes but you'll laugh, you'll cry. Bit later I nabbed some tickets for a rare nearby performance in nearby Essex. There'll be no interval, he announced that night, so grab a drink now and buckle up. Quite an evening. Good Lady Wife's birthday happened to coincide with his most recent show in that London so we made a night of it and caught the 344 from Southwark Street to The Latchmere. Fantastically atmospheric place, the Battersea Arts Centre. Both of us had forgotten our specs so grateful to secure a second row seat. 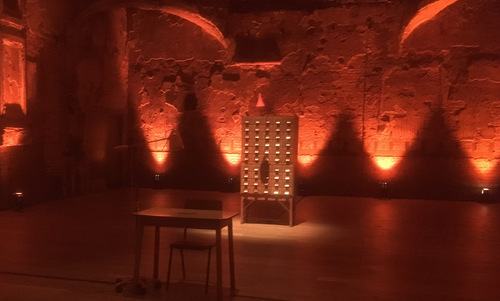 On the stage, a lone table, chair, and index card cabinet. Said cards in said cabinet were an itemized list of all, er, items in DK's home that he read aloud. A ceramic urinal. A birdfeeder. A brick. A brick. A brick. Fifty drawers, two minutes a drawer gives a two hour-ish show. Would be a shame to give any more away. Crowd was enthralled. DK paced to and from the cabinet until all was revealed. I think. Get a chance, go see him. You'll laugh, you'll cry. Consider the name Ipswich. Sounds a bit funny, perhaps, and I've met any number of people who'd be hard pressed to place it on a map. Ideal, then, for insertion into any script for comic effect. Time to gather together some of these TV and film mentions to see what we can learn. [Policeman] "Where do you live, Bill? What's your address?" [Policeman] "Is there a number?" 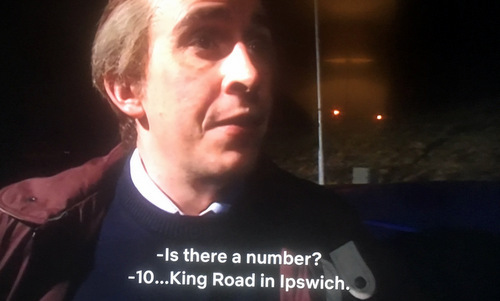 [Alan] "10 King Road in Ipswich." Not a massive stretch to mentally motor down the A140. Slightly disappointingly, the closest we come to such an address in the 'Swich is King Street in the town centre, home to the wonderful Ipswich Film Theatre and the currently dead Swan. Oh, Alan. Read the IMDb entry for I'm Alan Partridge. [Vince] "Just think how many millions upon millions of people got 'em right. The only people who won't know them are either dead or in ... Ipswich." Here, Errol believes he only has to answer a few simple questions to win a BMW. Sample question: what's the capital of Germany? Vince, as always, puts Error right. Great writing from Mr Lock and about time that the BBC bunged it on the iPlayer. Read the IMDb entry for 15 Storeys High. 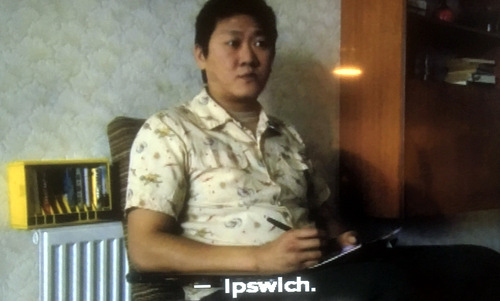 [Blair] "How was your journey from Ipswich, Dennis? Come down on Farage, did you?" 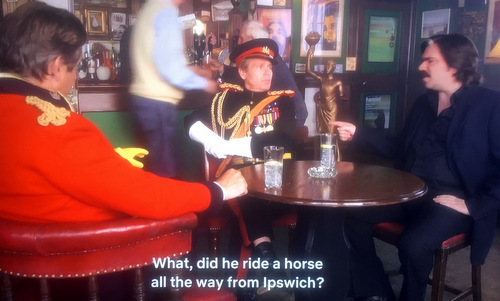 [Toast] "What, did he ride a horse all the way from Ipswich?" Very effective use of character names, there. Should mention Berry's latest album, a set of fourteen reworked television themes including The Good Life, Rainbow and World in Action. Wonderful stuff. Read the IMDb entry for Toast of London. [Ben] "Actually, I'm pretty sure Grandad told me he met Grandma at a dogfight in Singapore." 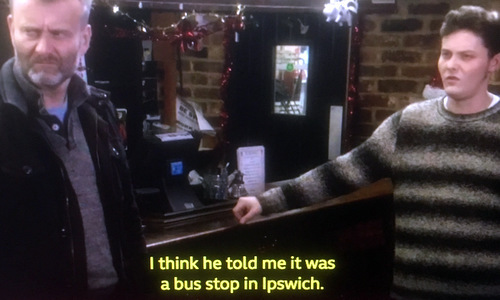 [Jake] "I think he told me it was a bus stop in Ipswich." From an exotic sovereign city state to humdrum Ipswich. Twas ever thus for the comedy scriptwriter. Read the IMDb entry for Outnumbered. [Neil] "Um, we have met before." 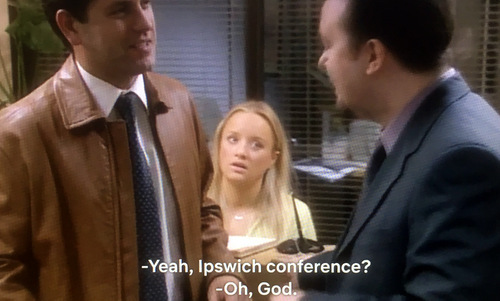 Of course, if you were serious about hosting your conference in downtown Ipswich, you'd be spoilt for choice from IP-City to Trinity Park through to Portman Road itself. FYI. Read the IMDb entry for The Office. [Sadia] "Remember Anara's boy, he walked all the way to Ipswich, thinking he was Jesus." 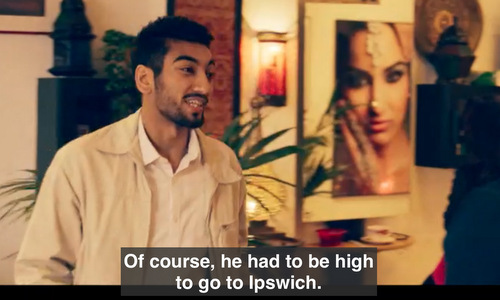 [Raza] "Of course, he had to be high to go to Ipswich." Unlike some other series, Informer kept going to its conclusion with much tension along the way. Hoping that Navhaan lands some other big roles as a result. Read the IMDb entry for Informer. [Mickey] "Can we change it to another voice? Can we have it in Italian like we did last time?" 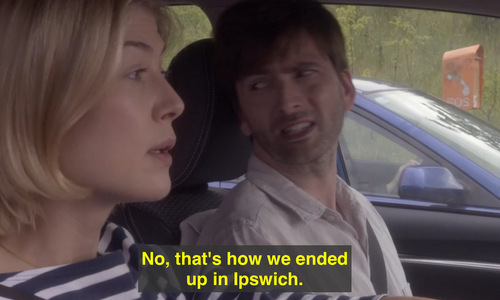 [Doug] "No, that's how we ended up in Ipswich." Well worth 95 minutes of your time with lots of laughs. Plus things happen that you will not expect, let's leave it at that. Read the IMDb entry for What We Did on Our Holiday. [The Doctor] "The whole thing's jammed. I can't open the door. Stay there, don't move." 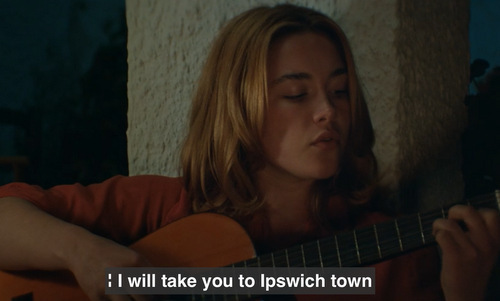 [Rose] "Where am I gonna go - Ipswich(?)" Must tell you the following line spoken by the computer: "Earth death in five minutes." Read the IMDb entry for Dr Who (The End of the World). [BFG] "Then he seen me, like you did. 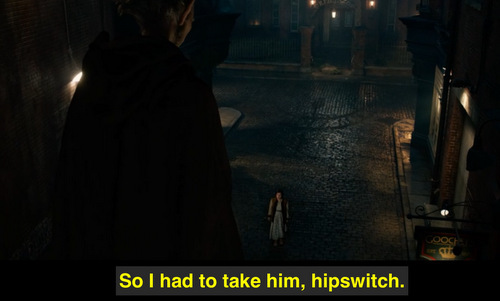 So I had to take him, hipswitch." I presume they're talking about the county town of Suffolk. Read the IMDb entry for The BFG. 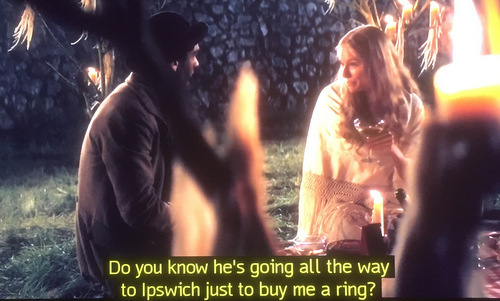 [Victoria] "Do you know he's going all the way to Ipswich just to buy me a ring?" 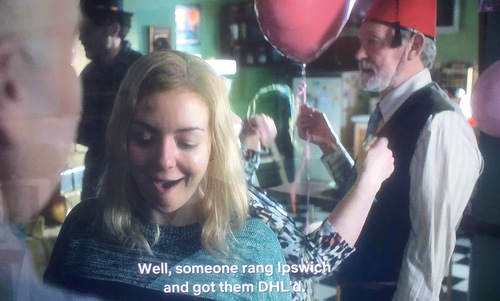 Almost as if there was money at stake, Ipswich is mentioned four times in this single scene. Notable that director Matthew Vaughan lives with Claudia Schiffer in the fair county of Suffolk. Read the IMDb entry for Stardust. [Christine] "But they didn't have them in my size?" [Bobby] "Well, someone rang Ipswich and got them DHL'd." Don't mind telling you that I had something in my eye as the credits rolled. Read the IMDb entry for Inside No. 9 (The 12 Days of Christine). [Praline] "This is Bolton, is it?" 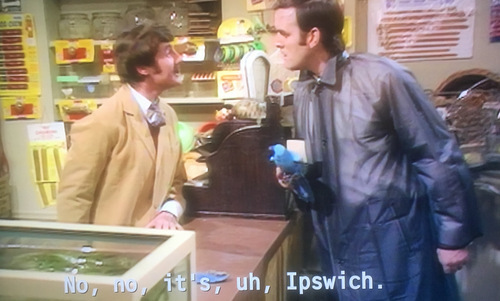 [Shopkeeper] "No, no, it's, uh, Ipswich." Scores based on number of mentions: Ipswich 3-4 Bolton. Read the IMDb entry for Monty Python's Flying Circus (Parrot Sketch). [Charlie] "I will take you to Ipswich town and there make you my wife." Bad lad, that William Corder. Read the IMDb entry for The Little Drummer Girl. That's more than enough mentions of Ipswich. Two-zero-one-niner and here we go again. Andy's survived the festive period. Shame that nobody thought to buy him a Gillette Mach 3 or one of those Harry's blades advertised everywhere. Probably just as well he's not got his hands on a cut-throat since he's slightly dejected after not landing a fresh job. Still hasn't found what he's looking for, our friend from the North. Out through Eyke-you-like past Jars Of Clay and left into the not-Poundbury that is Rendlesham. Andy's keen young eyes pick out the signs to the village centre to land a convenient parking place. By the ex-Costcutter Co-op and Chinese and hair and vets places stands the the Boardwalk. 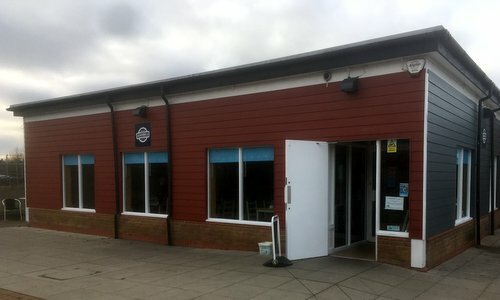 Sharing its name with its peer at Felixstowe, this one was opened late 2017 as "a local venue for the community". All very spacious and wooden and family-friendly, they're open from 10am until it's quiet. Proper kitchen's on the way. For now, we'll settle for a sausage roll and a bag of crisps, ta very much, with a J2O from the well-stocked bar. Pool table round the back, the good folk run craft mornings, show films and run occasional karaoke sessions. Poster behind Andy's back tells me that "Andy Otley IS Elvis" and I can see for myself for only a fiver. Bargain. Bunch of others enjoying a cuppa coffee on a chillsome day. We're more than happy to join them with a monster flat white and a humungous slab o'cake as per Friday traditions. Super friendly waitress, chatting with Andy the beard, tells us that they sometimes get wanderers from the Maharishi Peace Palace two minutes away. That's a story for another day. If it was a car -- WalkCar by Cocoa Motors. If they were passing by -- Tim Burgess. Some 250 years ago, Thomas Gainsborough, a wizard with the Winsor & Newtons, took the National Express from insular Ipswich to beautiful Bath. Not content to wait for one to appear at 777 Woodbridge Road (7am to 10:30pm), he wanted a spa there and then. Last Friday, 30th November, I undertook that very same journey. See, I done put some worms together and made up a tale. Every couple of months, canny Clare Reddaway (writer, playwright: website) runs Story Friday (website) and invites stories on a particular theme. November's was "feast". My own 2000 word entry was selected -- yowzah! -- and so I, along with seven others, was invited to come and read it. Aloud. In Burdall's Yard. A centre for the performing arts. Before an audience. Who'd forked out actual Bath bucks to get in. Nothing to worry about there. 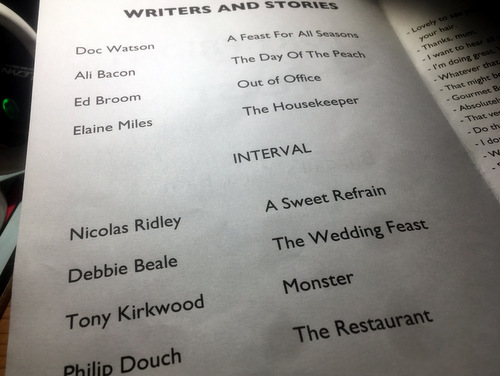 Doc Watson (website), playwright and writer, with wake-gone-wrong "A Feast for all Seasons"
Ali Bacon (website), writer, with the fruitily autobiographical "The Day of the Peach"
me (!) with the saintly but smelly "Out of Office"
Elaine Miles (website), playwright and performance story teller, with the tense Nairobi-based "The Housekeeper"
Nicolas Ridley (website), playwright, with the confectionery laden "A Sweet Refrain"
Debbie Beale with the bloodsoaked "The Wedding Feast"
Tony Kirwood (Facebook), comedy teacher and Fickelgruber and Death Eater, with the ghoulishly Oedipal "Monster"
Philip Douch (website), playwright and performer, with the ribald "The Restaurant"
Afterwards to the neighbouring King William for a wind-down glass of white with Clare who made it happen and has been making it happen for the last five or six years. Hats off. Could it happen here in the 'Swich? Did Gainsborough ever return? Cheers, Clare, for quite the night. 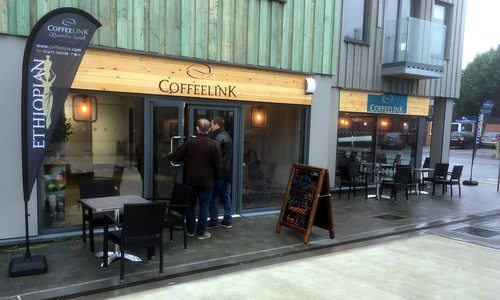 We've followed Coffeelink, East Anglia's coffee kingpins, from their ahead-of-its-time Ipswich waterfront location up to the nearby station, then up the A12 to Darsham and to the seaside at Felixstowe. Azzouz, the main man, was also good enough to invite us along to sample the goods direct from their roastery. Next stop? The Bridge of Wood. Yes, indeed. Amid the snazzy Whisstocks boatyard redevelopment and sited behind a hopefully state-of-the-art floodgate sits the latest branch. Behold Woodbridge Coffeelink. Early doors just yet -- we were there a few days after a "soft opening" -- but there's already a fridge holding six different San Pellegrino flavours, enough to impress YT. Grabbed our prepacked sarnies and headed to a corner table. Yes, one of us may have hit his head on a trendy low-level light. Furniture's dark in keeping with the original branch, ditto the bookcase, and there's half a boat to wonder at. Sidenote: vg selection of newspapers, bit of a dying art in coffee shops these days. Be sure to take in the colourful mural by local artist PC. Highlight for me was the excellent flat white from a highly knowledgeable barista who came to check on our orders. Probably didn't need that slice of carrot cake, TBH. Quiet for now but should become quite the hub once the weather's back and more units fill up. If it was a car -- Wallys Izis. If they were passing by -- Anthony Horowitz.